’63 Firebird III in (aged) Frost Blue. ’64 Firebird VII in Cardinal Red. ’64 Firebird I in (aged) Inverness Green. Unlike its rival from the West Coast, Gibson did not readily embrace the concept of offering custom-color finishes. It wasn’t averse to custom work or colorful finishes, but saw them more as a consequence of its wider range of stringed instruments – acoustics, electrics, and associated clientele. 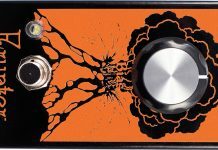 While competitors like Fender, Gretsch, Harmony, and Rickenbacker were happy to broaden their range of finishes with colorful shades, Gibson stuck to its (more-traditional) guns. The bold departure signalled by the gold finish of 1952 had no real follow-up until the inception of Cherry Red on the re-styled Les Paul Special and Junior in ’58. Factory records suggest that the color was originally used in ’57 as a one-off on an ES-295. Subsequently, Cherry Red was made available on many Gibson models, either as a standard finish or as an unlisted option before becoming the lead color on the new SG-style solidbodies and thinline electrics in 1961. The Seminole Red of this ’59 Cadillac is identical to Oldsmobile’s Cardinal Red. › › Leaving aside the decades-old use of black and white, Gibson’s earliest non-traditional finish was the blue it applied to the revamped Century lap steel of 1951. The most famous fancy finish applied by Gibson on a production model is the gold metallic on the Les Paul model of 1952, which originated on a late-’51 ES-175 presented to a disabled guitarist by Les Paul himself. 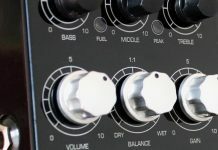 Despite its innovative design, the SG series failed to provide a decisive competitive edge, especially vis-à-vis the most popular Fender solidbodies. When the Firebird was launched in 1963, Gibson boss Ted McCarty felt compelled to endow the new models with 10 finish options, blatantly emulating Fender shades. A Gibson color like Golden Mist is strictly identical to Fender’s Shoreline Gold while Pelham Blue is Cadillac’s 1960 successor to the Lake Placid Blue used by Fender beginning in ’57. The ’59 Oldsmobile colors were widely used by Gibson, as seen in these charts listing Silver Mist, Polaris White, Frost Blue, Cardinal Red and Golden Mist (and also Fender’s Burgundy Mist). 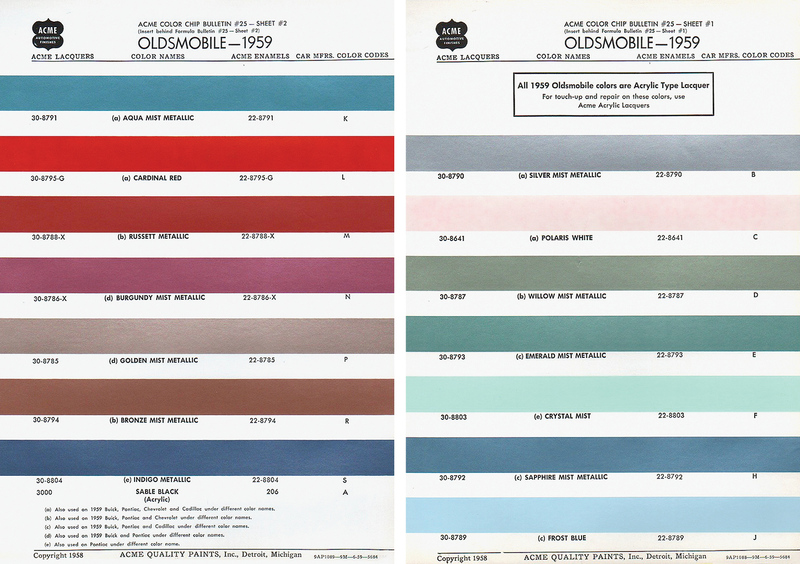 This 1960 GM chart shows how the same color was given a distinct name according to the brand – for example, Oldsmobile’s Golden Mist and Pontiac’s Shoreline Gold. (LEFT) Sparkling Burgundy is found primarily on thinline electrics. Color charts issued by Gibson in 1963 and ’66 do not mention the paints’ reference numbers, but their automotive name is sufficient to trace their origins (see accompanying table). It’s no surprise that Gibson’s selection shows a bias similar to Fender’s, with nine of the 10 colors originating from GM, only one from Ford. Their main automotive source, however, was Oldsmobile, with five colors, rather than Fender’s favorite, Cadillac, with three. 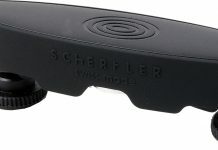 This gave Gibson similar shades, albeit with different names. Colors like Pelham Blue and Cardinal Red became available on other Gibsons, either as a standard finish as on Melody Makers, or as an option as on the Trini Lopez Standard. However, a couple of Firebirds were done with shades other than the 10 in the chart. For instance, the late John Entwistle, bassist for The Who, had a Firebird VII finished in Bronze Mist, from the much-used 1959 Oldsmobile chart. A ’59 Oldsmobile Super 88 in Golden Mist. 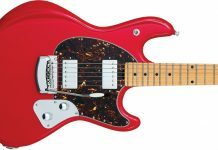 Some vintage enthusiasts think Sparkling Burgundy is also a custom color, and while the metallic shade resembles the Candy Apple Red found on Fender instruments, it was not, strictly speaking, an optional finish. Stanley Rendell, who served as president of Gibson in the early/mid ’70s, recounted the true origins of Sparkling Burgundy. (LEFT) Gibson’s first custom color chart was released in 1963, coinciding with the inception of the Firebird series. 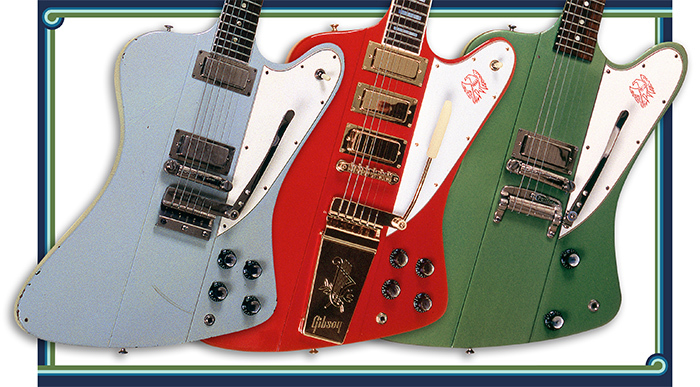 (RIGHT) The design of Firebird guitars was altered in ’65, but 10 custom-color options remained. The Inverness Green metallic color is much lighter than suggested by the aged finish found today on Gibson guitars from the ’60s. Gibson Custom Colors/illustrations © AR Duchossoir, 2016. 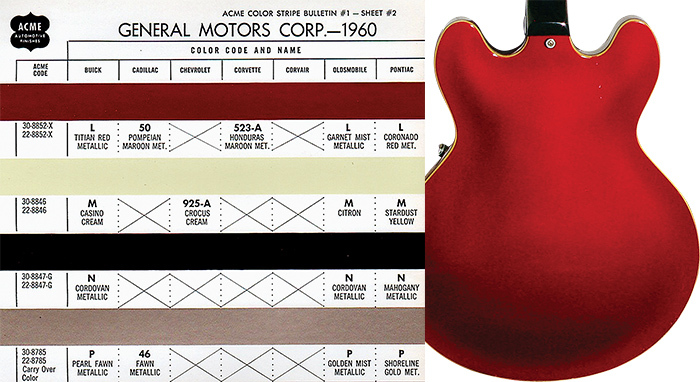 This explains why, as of 1967, Sparkling Burgundy was listed as a regular finish, not a custom option, on the thinline models – ES-355, 345, 335, 330, and EB-2 (D). At the same time, it was offered standard on the Flying V reissue and Melody Maker in lieu of Fire Engine Red. More rarely, Sparkling Burgundy was applied to SG bodies; oddly enough, practically no Firebird or Thunderbird was done with it. In ’67, Gibson introduced walnut as a regular finish on several models in order to diversify its traditional offering. 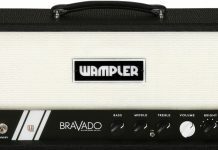 Walnut would eventually supersede Cherry Red on SG-styled solidbodies and thinlines, while later also becoming the basic finish on the low-impedance Les Paul models launched in ’69. 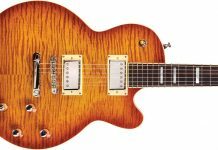 At a time when the company was going through a fairly traumatic period following the departure of McCarty and vice president John Huis, it was probably with great relief that Rendell and the new Gibson management oversaw the (temporary) end of optional custom colors. NOTES: #1 This color (DuPont 2697-L) first appeared in 1958 on Chevrolet cars under the name Snowcrest White. In ’59, it was given other names like Polaris White (Oldsmobile), Artic White (Buick), Cameo Ivory (Pontiac) and Dover White (Cadillac). #2 Cardinal Red is a fairly common name in the world of automotive paints. It was first used by GM in 1955, albeit with a formula (DuPont 2411-H) distinct from the one used by Gibson beginning in ’59 on Oldsmobile cars (DuPont 2931-L). As was customary with GM, the same color was used across divisions under different names – Mandalay Red (Pontiac), Roman Red (Chevrolet), Seminole Red (Cadillac) and Tampico Red (Buick). Cardinal Red lasted only one year at Oldsmobile, but made a return in ’62 on Buick cars. This may be what prompted Gibson to use it as the equivalent of Fender’s Dakota Red. #3 This color (DuPont 2721-H) was also used in ’59 by Ford Mercury under the name Canton Red, and on the Ford Mustang in ’67, as Aspen Red. #4 Frost Blue first appeared at GM/Oldsmobile in 1955, with a formula (DuPont 2007) different from the ’59 paint used by Gibson (DuPont 2937-L). As was customary with GM, the latter was used in other divisions under different names – Castle Blue at Pontiac, and Wedgewood Blue at Buick. In ’59, a distinct Frost Blue shade with a metallic tinge (DuPont 2925-L) was concurrently used on the Chevrolet Corvette. #5 As was customary with GM, this color (DuPont 4148-L) was used in other divisions under a different name – Alpine Green (Oldsmobile), Seacrest Green (Pontiac), and Seafoam Green (Chevrolet). It should not be confused with the darker Kerry Green used on Pontiac cars in ’56 (DuPont 2428). #6 The Inverness Green name appeared in automotive paints in the 1930s. 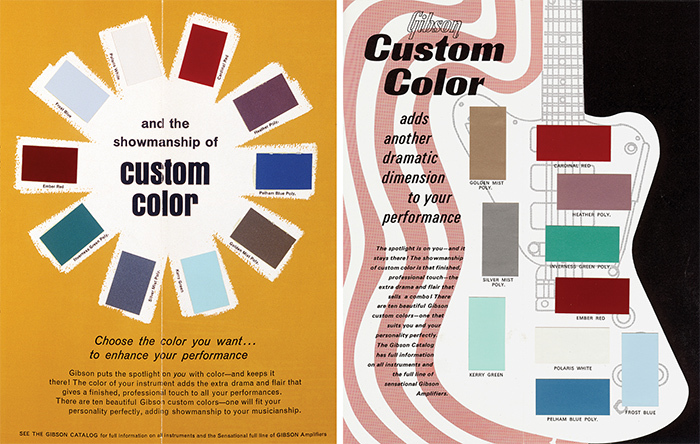 The ’59 paint used by Gibson (DuPont 2940-L) should not be confused with the other Inverness Green shades found on Cadillac cars in ’52 (DuPont 1331-H) or ’65 (DuPont 4679-L). #7 This color (DuPont 2935-L) was used across divisions under different names – Fawn (Cadillac), Pearl Fawn (Buick) and Shoreline Gold (Pontiac). It should not be confused with the Gold Mist used in 1956 on Oldsmobile cars (DuPont 2439-L) or in ’58 on Buick cars (DuPont 2799-L). #8 This color (DuPont 2934-L) was used in 1959 in other GM divisions under different names – Grecian Gray (Chevrolet), Silver Birch (Buick), Silver Metallic (Cadillac) and Silver Mist Gray (Pontiac). However, it differs from the Silver Mist used on Buick cars in ’58 (DuPont 2573-L) and ’60 (DuPont 4023-L). #9 The 1962 Cadillac paint used by Gibson (DuPont 4304-L) should not be confused with Heather found on Oldsmobile cars in ’58 (DuPont 2793-L) and Cadillacs in ’60 (DuPont4044-L). Cadillac’s Pelham Blue Metallic became one of Gibson’s most common custom colors in the ’60s. 1960s SG solidbodies with Pelham Blue. 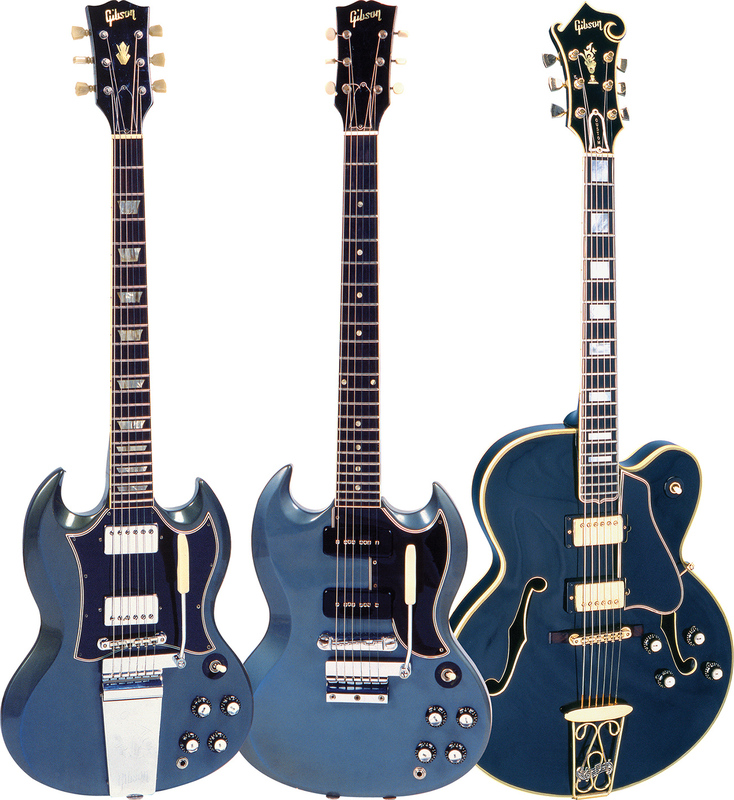 (RIGHT) A highly customized 1960 ES-350TD with a bespoke dark blue finish. 1960 Gibson ES-350TD: George Gruhn. 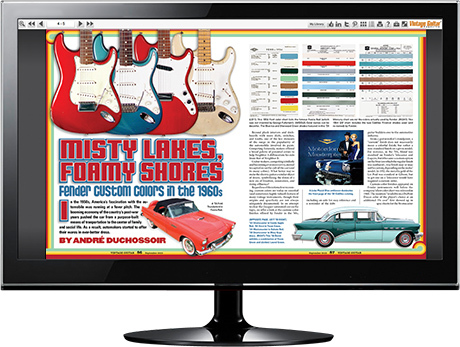 The September ’15 issue contained recap of the custom colors listed by Fender beginning in 1960. Access the article here: vintageguitar.com/24640/fender-custom-colors-in-the-1960s. 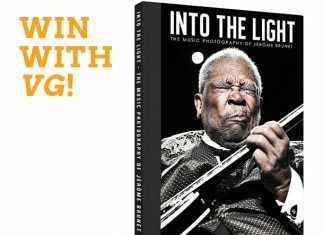 Order the Sept ’15 issue here: store.vintageguitar.com/back-issues/back-issue-september-15.html.